The Great Barrier Reef (GBR) is the world's largest coral ecosystem and it has been experiencing significant water quality deterioration due in part to agricultural intensification and urban settlement in adjacent catchments. The land-derived pollutants are responsible for the degradation of instream water quality in the GBR catchment. The spatial and temporal variations in water quality hinder the interpretation of the water quality monitoring data. The water quality monitoring program provides a potential opportunity to develop a data-driven understanding of water quality at catchment scale; including both natural and anthropogenic influences on water quality. 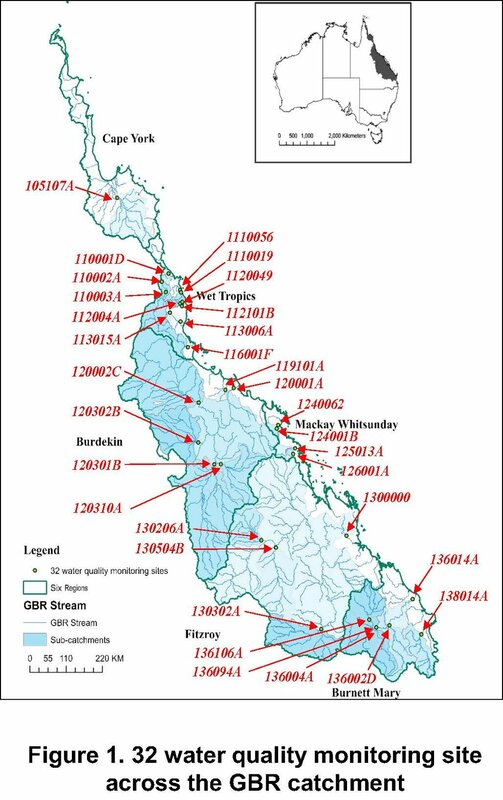 In this project, we investigated water quality monitoring records from 32 site across the GBR catchments (Figure 1). We adopted Bayesian hierarchical modelling: decomposes the complex interactions in the observed data into a series of conditional models. We incorporated the spatial variability in stream water quality within a two-level modelling structure to capture the variability between sites (Figure 2). The modelling results (Figure 3) indicated large positive deviation: Burdekin and Fitzroy sites, especially 3 upland sites in Fitzroy. The inference of the model parameters (Figure 4) showed that: 1) land use - grazing and dry land agriculture have significant impacts on source of TSS; 2) geology: soil erodibility - impact on pollutant mobilisation (erosion effect); 3) topography: slope - impact on pollutant delivery. Hydrological modelling is used as a tool to understand and quantify hydrological processes and is applied in predictions and decision-making processes. Model parameters that cannot be measured directly should be calibrated to make models accurate. Thus, the observed discharge data that can be used to constrain the model parameters are essential. However, the majority of the streams in the world are ungauged or sparsely gauged. In these catchments, the uncertainty issue is quite obvious and significant due to the lack of continuous discharge data. Thus new calibration methods that could use water level data instead are crucial in streamflow prediction in ungauged and poorly gauged areas. The availability of altimetry data is likely to provide h to many ungauged catchments. Scheme 2: Inverse Rating Curve based scheme (IRC). A small number of discharge measurements (50th, 75th and 95th percentiles of Q_obs) and some regionalised runoff ratio values are used to constrain the model parameters. SRC/IRC with a small number of high flow Q_obs could effectively improve the calibration performances (Figure 2). Instead of high flow data, other effective factors are explored to constrain the model performances.